DUP deputy leader Nigel Dodds said his party's support for the Conservative government is not unconditional. It comes after he and Arlene Foster met with Prime Minister Theresa May in Downing Street on Monday. During the meeting, Theresa May said the UK will not remain in the customs union or the single market after Brexit, Mr Dodds said. 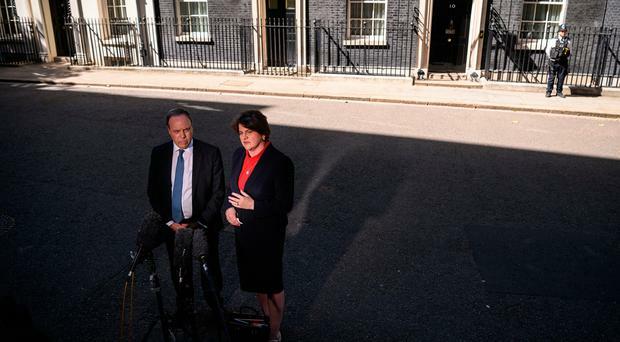 The Prime Minister said there would be no breaking up of the UK "economically, politically or constitutionally" following Brexit, Mr Dodds told reporters after he and party leader Arlene Foster spent almost 90 minutes with the Prime Minister. A new customs plan to solve the Ireland/Northern Ireland border issue was discussed but the Prime Minister "didn't go into any details", he added. Mr Dodds also accused Taoiseach Leo Varadkar and other European leaders of attempting to "bully and intimidate" the UK into agreeing a deal of their liking. Asked by reporters after the talks about whether his party - which has a supply and demand deal with the Conservatives - would support Mrs May regardless of what happened at Chequers on Friday, he said: "We don't give blank cheques to anybody and I think it is very clear that we don't. Theresa May is expected to outline a new plan for Brexit at a crunch meeting of her cabinet at Chequers at the end of this week. "On Brexit we want to see a proper Brexit which fulfils the referendum result. We have been very clear that has to be on the basis that the whole of the UK leaving the EU as one. I'm confident the PM will deliver on that," Mr Dodds said. DUP leader Arlene Foster later tweeted to say she had been given assurances the government was committed to "take whatever steps necessary" on decisions concerning the administration of Northern Ireland as the political deadlock continues.